It is difficult to tell where the infinity pool stops and the ocean view starts. La Vue Panoramique is literally the villa of panoramic views, and you can see St. Maarten, Anguilla, Grand Cul de Sac, and Marigot Bay from this hilltop retreat. Located in Mont Jean, the villa has westerly facing views for optimal sunset and ocean viewing from the private nooks of the terrace, the overflow pool, gardens, grassy lawn, alfresco dining/grilling area, and the copula-covered dining area. The views follow you inside; the large living room opens to the ocean and offers more views through the picture windows. This leads into the fully equipped provincial-style kitchen. On opposite sides of the living area are two bedrooms with en-suite bathrooms. One features a private den and the other panoramic views. Complete privacy and incomparable scenery make this an ideal retreat. 300 degrees of breathtaking views! Located in Mont Jean, La Vue Panoramique Villa has 300-degree views of St. Maarten, Anguilla, Marigot Bay, and Grand Cul de Sac. The large black-bottom infinity pool is heated in the winter and has a wide deck with views. The large open living room has white sofas and chairs with dark brown furnishings, original fabrics, and upscale accessories. The master bedroom has leather and wicker furnishings, loveseat, leather headboard, en-suite marble bathroom, and three large windows. The second bedroom suite features a connected office and views of Marigot Bay. 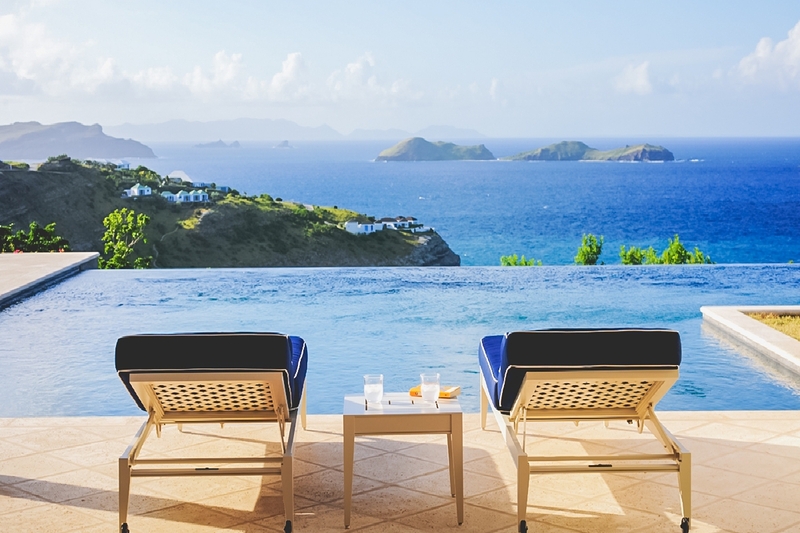 An open dining area overlooks a waterfall, pool, and St. Maarten and Anguilla beyond that. The separate kitchen is well-equipped and includes a wine cooler and mural. An outdoor barbeque is located on the terrace by the pool and has views of the sea. There are a number of terraces. La Vue Panoramique Villa is private and designed for your comfort and enjoyment. SPECIAL NOTE: this villa rents for the list price over Thanksgiving; there is no price per bedroom. A short drive to Lorient beach.